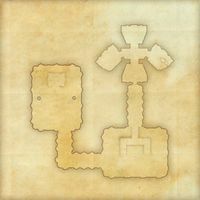 The Shad Astula Academy was built on the foundations of much older buildings, and some of those underhalls are still in use—including the library vaults accessible through the offices of the Arch-Mage. 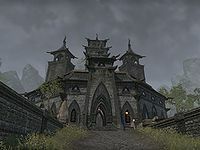 Shad Astula is an academy of magic located in north-central Deshaan, just northeast of Mournhold. The school is extremely exclusive and you'll need to acquire an invitation in order to visit. 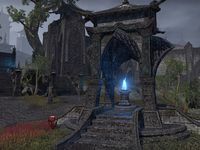 Once you have obtained an invitation, you can take a boat from Mournhold's docks, which will bring you directly to the academy. The head of the academy, Arch-Mage Valeyn, will immediately recognize that the invitation is not yours, but will allow you to stay if you help him with several students. The considerable Academy grounds have their own docks, two ponds, a testing field, administrative buildings, instruction halls and housing chambers. The eastern side of the campus is occupied by Instruction Halls and instructor housing, which consists of the northern and southern chambers. The testing field and Dormitory are located on the western side. The administrative part of the campus, situated atop the hill, includes an Instructors' Lounge, courtyard and Arch-Mage's Office. Shad Astula Objective: Learn the secrets of the Academy of Magic. Shad Astula Wayshrine is located in the middle of the campus. * Presence of this NPC at this location is quest-dependent.